Background: Benign cystic diseases of the liver have recently been treated by non-surgical procedures such as alcohol injection and trans arterial embolization (TAE); however symptomatic or complicated cysts often need surgery. Traditionally, laparotomy is the procedure of choice. 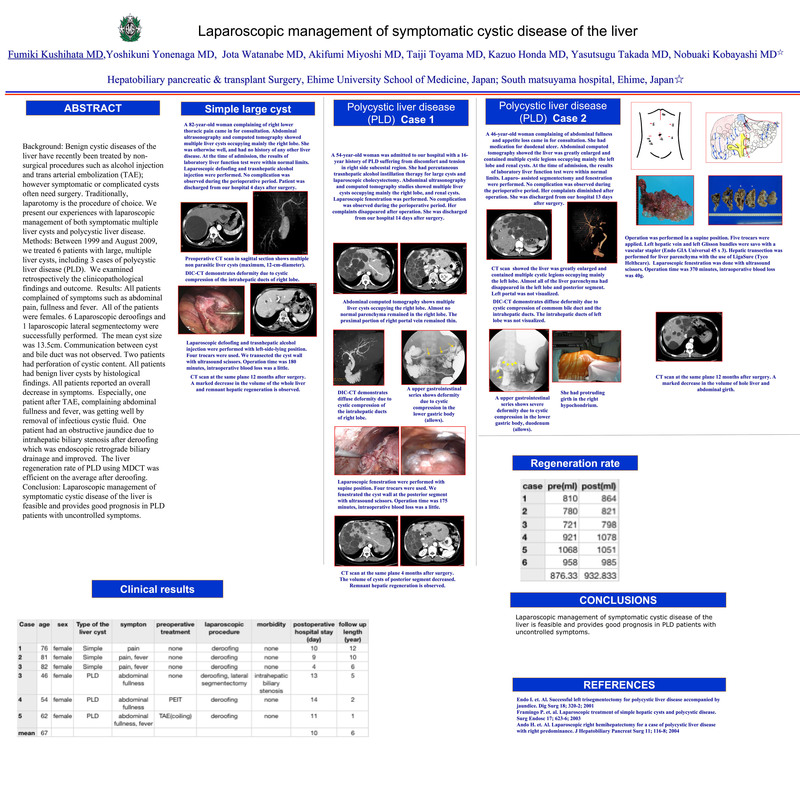 We present our experiences with laparoscopic management of both symptomatic multiple liver cysts and polycystic liver disease. Methods: Between 1999 and August 2009, we treated 6 patients with large, multiple liver cysts, including 3 cases of polycystic liver disease (PLD). We examined retrospectively the clinicopathological findings and outcome. Results: All patients complained of symptoms such as abdominal pain, fullness and fever. All of the patients were females. 6 Laparoscopic deroofings and 1 laparoscopic lateral segmentectomy were successfully performed. The mean cyst size was 13.5cm. Communication between cyst and bile duct was not observed. Two patients had perforation of cystic content. All patients had benign liver cysts by histological findings. All patients reported an overall decrease in symptoms. Especially, one patient after TAE, complaining abdominal fullness and fever, was getting well by removal of infectious cystic fluid. One patient had an obstructive jaundice due to intraheatic biliary stenosis after deroofing which was endoscopic retrograde biliary drainage and improved. The liver regeneration rate of PLD using MDCT was efficient on the average after deroofing. Conclusion: Laparoscopic management of symptomatic cystic disease of the liver is feasible and provides good prognosis in PLD patients with uncontrolled symptoms.